To honor students in 1st grade. Pledges said and anthems sung. In case his teacher passed him by. And find deserving of a prize. Grandma smiled ear to ear. Too young to have assumed defeat. Good citizens to name a few. Who’d learned to write and learned to read. My boy had worked hardest of all. I drove straight home, sobbed all the way. The boy? He had ceased to care. He had a mom and she was there. What happens to a child that, no matter how hard he/she tries, they never win an award? What if this was your child? As we near awards ceremony days in schools, please take a moment to reflect if this is, in fact, a positive tradition in our schools. Join The Movement to Recognize All Students. The "Weejie Award" from '88 that hangs above my bed for inspiration. 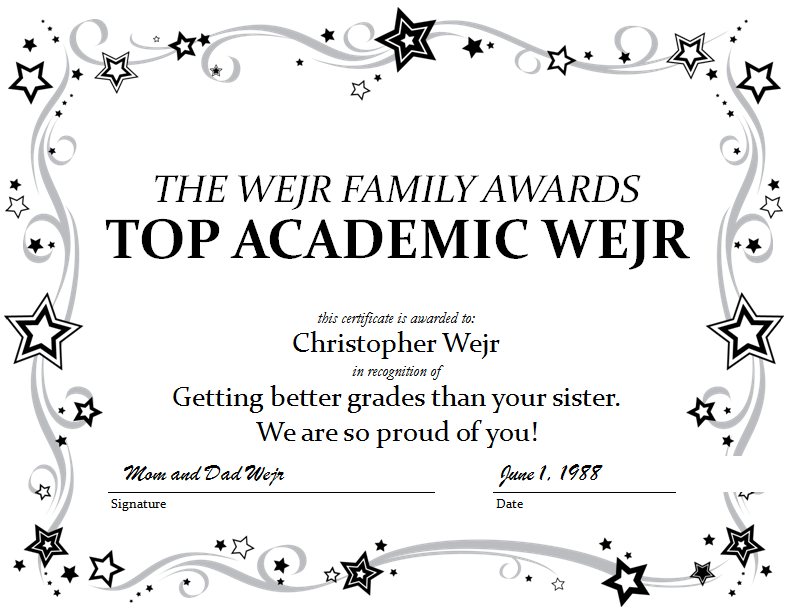 As we approach May, and now that I have 2 daughters, it is time to continue a long standing Wejr Family tradition – the “Weejies” – The Wejr Family Awards. Growing up, I was an A student and a decent athlete so I always looked forward to the day when my parents invited my family over to watch me beat out my sister for the academic and athletic awards. I really think this helped me to become successful in the “competitive real world” and losing these awards motivated my sister to try harder. She was brilliant in areas such as care, friendship, and family but always needed a little boost in her quest for the important real world things like grades and trophies. Although we were two years apart and developed at different rates, I believe that it was important for her to learn how to lose and see that there are people better than her and that she needed to work harder in areas that were important, not to her, but to my parents. So now, my wife and I have decided to continue on this journey. 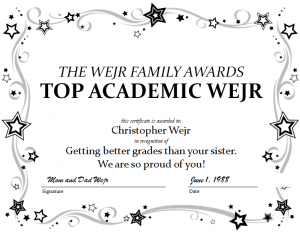 Our first Wejr Family Awards have been discussed. We have one daughter that was born 3 lbs heavier than the other (they are twins). She has developed a few weeks ahead so is going to clean up this year! We are so proud and excited for her. Our other daughter will be motivated by these awards (that have nothing to do with development, of course) and will try harder to maybe be the first to walk or even talk! (I look forward to grading them in their journey to walk and ride a bike – its important that they know where they are at and what better way of showing them this than a letter grade?). The key here is that by encouraging our children to strive for these awards, and defeat the other, they will achieve more and be pushed toward a more successful career in the real world. I know that without these awards, given once a year at the end of the school year, my girls will struggle to see the value in learning and helping others. That is why I am so excited to continue the tradition of… “The Weejies”. Obviously we would NEVER do this to our kids… so the question is: WHY DO WE DO THIS IN SCHOOLS? NOTE: I want to thank my parents for always encouraging and seeing the strengths and interests in their children. My sister and I had completely different strengths and because of my parents, my sister continues to be my best friend and teach me so many things in areas in which she excels: compassion, care,and family. Awards Prepare Kids For The ‘Real World’ – Really? I am pleased to have Brian Barry (@nunavut_teacher) as a guest blogger. Brian is a Grade 9 Math/Science teacher from Iqaluit, Nunavut, Canada who is passionate about education technology and human motivation. His thoughts on motivation, including rewards and punishment, continue to inspire me as an educator. For more thoughts from Brian, check out his blog, Against the Wind. “Yes, there is a wide range.” So I asked why is it fair to be giving out an award for “Best reader” in your class if it is not a fair contest? I also noted students don’t walk into class with a choice to compete for that award. It is a given. The competition is forced upon them. Indeed, when I framed the anti-award argument in that way, I made some head way with them. In the world outside of school, people only compete when they want to. We only compete against peers. So, if you want to wrestle you choose to do that against others who choose to wrestle. Further, you wrestle against your peers- the same weight class. Moreover, Rick Lavoie also notes the following: Only people who feel they have a chance of winning will compete. Thus, the competition in class only works for a few. Indeed, competition creates an atmosphere where students see each other as obstacles, instead of seeing them as team or group members working for a common cause- learning. How can we truly see the potential of our students if we fail to provide the environment to bring out their talents? I have always wanted to be a high school teacher and I was exactly that for 7 years. You never know where your life will lead you and, while completing my Master’s Degree, I was offered the opportunity to work with an amazing principal at an elementary school. Roxanne taught me to seek out the strengths in people and bring these talents out from within and opened my eyes to the power of strength-based, rather than deficit-based, teaching and leadership. My aha moment came in my first few months of being an elementary school teacher and a new vice principal. When I did the tour of the school I was to be a teacher/vice principal, I met Daniel (pseudonym). Daniel had a smile that was contagious but was disengaged and struggled in school; the reason I met him that day was that he was in the hall after being asked to leave class. I never asked him why he was in the hall, I just started asking him about his life outside of school; we talked about music and friendships in the few moments we shared together on that day. The next year, I was to teach a 5/6 class (in addition to the vice principal duties) so when we were creating the classes, I requested that Daniel be placed in my class. To be honest, in the first month, I really struggled with the transition from teaching 17 year-olds to teaching 11 year-olds. Many of the students had behaviour, social, emotional, and academic challenges so I spent many hours bouncing ideas off Roxanne and other teachers trying to find out how to reach these kids. I specifically started to talk about Daniel as he was so withdrawn in class – always refusing to take part in any learning activities and that smile that drew me to him seemed to have disappeared. She asked me what I knew about him; the truth was that I knew very little about him other than he struggled in class and liked music. She encouraged me to find out more about him; find out what he loved, what he was good at and try to bring that out in him. During the next week, I spent a recess having a snack with Dan. I found out that he lived in a nearby community in which he spent two hours on the bus each day, lived with his Grandmother because his mother was far too young, and we shared a common interest in Johnny Cash. We spent much of the recess singing a variety of Cash songs and just laughing. Later that day, I was speaking with the First Nation Support Worker (Nelson), sharing with him about the moment that had occurred, and he let me in on another strength of Daniel: First Nation drumming and singing. He said this was something that he recently witnessed in his community but maybe something that we could support. The FNSW asked me if he could take Daniel and a few others to work on this interest; I believed this was a great opportunity so for 2 weeks, Nelson spent a few mornings a week drumming with Daniel and two others. What progressed after this changed the way I teach and live my life. I asked Daniel if I could come watch one recess. I was blown away. Daniel was so into the drumming and singing that he would actually be sweating with pride as he was doing this. A few weeks later, I asked him if he could perform for our class – he unfortunately declined. Nelson encouraged him to sing and drum with him in front of our class. He nervously agreed and blew us all away when he performed; other students cheered when he finished and then asked if they could be part of “his group”. Daniel was now not only working with his strengths but also leading others to do the same. His group added girls and grew from 3 to 6 and then 8, including 2 students from another class. They played for our class every Monday morning, to start our week, and every Friday afternoon, to finish our week. They even gave themselves a name, Sacred Connections, and began to play for other schools and community events. The moment that brought me almost to tears was right before Christmas. Each week, 1-2 new students would join up front in the singing and drumming. We often don’t see the impact of small changes but right before Christmas, the group actually had no people to play for, because every single student was up there singing with Daniel! To create an audience, I invited Roxanne and a grade 4 class to come and see the performance. We all sat there in awe of what Daniel had done not only as a performer, but also as a leader. The other parts of Daniel’s school and life were drastically changing too. His friendships grew, his efforts in school improved and he became very engaged in learning activities. His reputation grew as a leader in the school and community and his group was asked to play at a local pre-Olympic Games (2010) event and in the spring he was asked to perform with Pow Wow drummers at a huge event in front of our entire school and community! Daniel had gone from a disengaged, quiet student who refused to take part in the learning to a proud leader and confident learner in our school. Daniel leading the "Welcome Song" to start our week. That year was one that changed my life. It was not just one aha moment but a series of moments that shaped me as a person. I want to thank Roxanne, Nelson, and most importantly Daniel for teaching me that, as educators, the most important thing we can do is provide the optimal conditions for people to grow, bring out their strengths, and truly flourish. Rather than only recognize those select few award winners at the end of the year, we need to honour every student every day. Every child has a strength and passion within him/her; we need to help EVERY student to find this and excel in his/her own way. 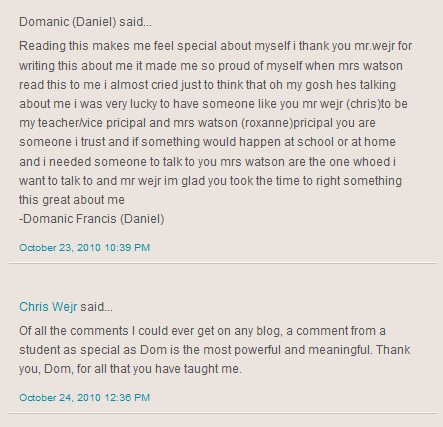 Here are the comments that the person who taught me the most about this, Dominic (Daniel). As a result of our school’s decision to end our traditional awards ceremony and the blog post by Janet Steffenhagen, Bill Good of CKNW 980 in Vancouver interviewed me and hosted callers on the topic of awards, grades, and motivation in schools. Please have a listen – would love your thoughts and feedback. UPDATE – I have added the radio interview with John Tory of the Live Drive on NewsTalk 1010 out of Toronto. Thank you to Shannon Smith for recording. I was a bit frustrated with the focus on grades as I was more prepared to discuss the impact of our decision at our school but grades, too, fall under student motivation and is an important conversation to have. The interview is 18 minutes long and the last caller provides some shock value for you! One of my grade 3 students said it best while listening to the interview (and the last caller) with his mother when he asked, “why is he saying school is bad?” Love it. From the book: “Breaking Free From Myths About Teaching and Learning” by Allison Zmuda. Please click here to listen to CKNW interview, come back and leave a comment with your thoughts. Thank you to Bill Good and CKNW for the opportunity to continue this important conversation. Please click here to listen to NewsTalk 1010 interview. Thank you to John Tory for the opportunity. Awards: One winner, many losers. This week the topic of awards surfaced again on Twitter. As a result, Vancouver Sun reporter Janet Steffenhagen posted part of my blog “Death of An Awards Ceremony” that described the decision parents and staff made to significantly alter the way we recognize kids. Instead of our year-end awards ceremony, we decided to have a year-end honouring ceremony along with recognizing individuals throughout the year for their individual strengths and passions. Awards ceremonies are zero-sum, meaning that although they create a few winners, they create many losers. Some great conversations are happening on Janet’s post so please chime in with your views here. Sport is huge in my life. My friends, players and teammates will tell you: I am one of the most competitive players and coaches in the rink and on the court. I have spent the majority of my adult life coaching volleyball, basketball, and track. During this time, although the main goal was never to just win but more about the journey and process, I was involved in sports that resulted in a winner and a loser. I am not against competition (there are still fun, healthy competitive games in schools and classrooms); I am against awards ceremonies and events that place emphasis on the result rather than on the learning. The key difference between sport and learning is that you CHOOSE to play sports and you go in with the knowledge that there is a winner and a loser. Students should not go to school to win; students should go to school to learn. Students should not go to school to compete for some award at the end of the year; students should go to school to collaborate and learn from teachers and peers. We rob our children of intrinsic motivation by continually offering extrinsic motivators. Also, for those who say, “if we get rid of awards, we might as well get rid of test scores and grades and entrance exams”; I say: ABSOLUTELY, these also do not promote learning. I will, however, leave this conversation for another post. When/why did learning in school become this zero-sum activity that creates winners and losers? Are certain areas of school favoured over others? How do you award the top learner? How is one learner better than another? How much do politics play into awards in schools? When did learning in school become a place where “some students need that competition to excel”? Is it more about the parents wanting their kids to have awards or is it about the kids needing awards? Who has taught these kids that awards are important? What stays with you for life – the intrinsic motivation of knowing that one can learn or the extrinsic motivation of trophies, certificates and prizes? Obviously, I am being a little cynical with these questions but hopefully it makes people reflect on the flaws in having learning viewed as a sport with winners and losers determined at awards ceremonies. If all students can excel in something and all students can learn, how can there be losers? The answer: hand out awards for learning and make learning a sport. We need to work to see the value and strength in EVERY child, EVERY day. If we resort to recognizing only a select few at the end of the year, we are failing the majority of our students. Let’s tap into our students’ interests and work to honour our students for the strengths and passions within each one of them. Learning is NOT a sport, it is a journey; an enjoyable journey that never ends. When principals come up and give farewell speeches to classes leaving their school, they often talk about moving on and getting a step closer to the ‘real world’. Lately, I have been pondering this idea and I have come to the realization that to our students, school is the real world. This is not some fantasy fake world that exists in some other level or continuum – this IS the real world. We have to be careful about ‘warning’ our students about entering the real world because as I have grown to know these amazing students, I have realized that their present real worlds may actually be more difficult than the world in which they will enter after high school. Many of the kids in front of you are determined, supportive individuals who have overcome an unbelievable number of challenges and obstacles just to get to this point in their education. This needs to be recognized. EACH student needs to be recognized for all their strengths and talents that they have; they also need to be recognized for the contributions they make to our school and community. As you are well aware, the Kent Staff has made a monumental step to change the way we honour our students. In the past, we would be here and watch a select few students get recognized; we still want to recognize those athletes and academic students, but what about the students who spend every lunch hour working with younger students? How do we recognize them? They do not do this for any award, they just do this because it is the right thing to do – and this needs to be recognized. I will never forget last year when I overheard a student say that they “lost the athletic award”. This student has a strength in athletics yet he viewed not getting the award as a loss. This is exactly why the First Nation program at our school puts on an honouring ceremony that recognizes the strengths of every FN student in the school and why we have expanded our year end ceremony to include all members of our grade 6 class. The recognition of all our students is so important and so very well deserved. In the next few minutes you will hear teachers talk about their students’ strengths and qualities. It is our hope that these students are already aware of these amazing qualities and will leave our school and continue to focus on these talents. It is our hope that these strengths are, in fact, passions and that they spend their time doing something in which they are passionate about. So grade 6’s, you know what you are good at – do it! Really challenge yourself in these areas. Push yourselves and encourage each other in these areas of strengths. When you push yourself you might actually go outside of your comfort zone and take a risk. When you do this, you WILL make mistakes – please remember mistakes are made because you are pushing yourself and that is a great thing. That is how we learn and move forward in life. My wife, Tonya, is a dance teacher and there is a saying that she uses in dance: “if you fall, make it part of the dance”. That is what we want you to do – push yourselves, take risks, fall, get up – and make it part of the dance, make it part of your plan. Times when you fall is when the best learning takes place. Thank you for showing me that kids do NOT need to do things for a reward – the volunteer time you have put in to help supervise our primary students at lunch time, run our gym equipment room every single day, go out every lunch and help students in our strong start centre, preparing lunches for gatherings of our families and elders, helping to ref mini-hockey games in the primary end, for giving back to our community by giving up your Saturday to accompany two of our valued elderly adults as you pushed them in their wheelchairs to attend the Highway of Heroes event a few weeks ago. These are just a few of the things that you have taught me. You have not participated in these important activities for any reason other than ‘because it was the right thing to do’. We need to recognize and honour all of you for not only your accomplishments and strengths but also what you have taught us during your time here in your ‘real world’ at Kent. Today is your day, enjoy the moment and we wish you nothing but the best in the next phase of your education. If you read a previous post, “Death of an Awards Ceremony“, you are well aware of the change that Kent Elementary School made this past month. The staff decided to abolish all the awards and honour roll recognition and replace this with an honouring/recognition ceremony for ALL our grade 6 students. Although the conversation started about 3 years ago (with the previous principal), I continued the conversation and happened to be principal when the decision was made; due to this, I kind of took the weight of the ceremony on my shoulders as I wanted it to be so successful that people would wonder why we ever did the awards ceremonies in the first place. Rather than trying to summarize the entire afternoon event, I will discuss a few key bits of information as well as the moments that stood out to me. We have 4 grade 6 teachers at our school this year (with splits and shared teaching loads). Each teacher spoke about the student in their class for about 30 seconds and the best part was that they spoke in their unique style. One teacher listed off the many positive qualities and key moments she had observed throughout the year, two other teachers (who shared a class) shared a short and entertaining poem about each student, and one teacher entertained the students and audience with his wit as he spoke of how he pictures his students using their strengths in the future. In past years, we normally had an Awards Ceremony for students in grades 4 through 6 which included about 175 students. We set up 100 chairs and that usually sufficed. This year we were recognizing 55 grade 6 students so I figured 100 chairs would be plenty. By the time the ceremony started we had added another 40 chairs and by the time students were recognized, there was a wall of people standing at the back. I did a scan of the audience and as far as I could tell, every single student had someone there to observe he/she get honoured by their teacher. In the days leading up to the event, I even had some parents ask if their child was going to get an award because they wanted to know if they should take work off; I loved responding to these questions (yet another reason why this format worked well) and saying that each child would be recongnized. I taught half of this grade 6 class last year so there were many great moments for me; however there were two that summed it all up. A student, Andrew (pseudonym), was called up to be recognized. The process was for the student to stand, listen to the comments from the teacher and then shake hands with a few people and receive their certificate (which stated their strengths and interests). While the teacher was speaking, a slide would show with pictures of the student and a list of their strengths. Now Andrew is an extremely quiet child that is not the best athlete nor is he the most academic; he is, however, a great kid. As he was called up, he checked at the slide to see the picture of him and read his strengths. At this point he was trying to hold back a slight grin. When the teacher said that he was a gentle guy, he tried to bite his lip to stop him from smiling. When the teacher commented on his skills in technology, he could not hold back the grin much longer. When the teacher said he is the “man with the swagger” and a “true gamer” and one who will be working for EA Sports (video game designer and producer), Andrew let out a grin and a laugh that I will never forget. I taught this child for an entire year and I have never seen him beam with pride like that. The other moment happened the day following the ceremony. A girl, Tanya (pseudonym), was recognized the day before and one of her strengths was that she was ‘quiet, clever’. The next day, this individual was helping me to clean the gym and out of nowhere, this quiet girl asked, “Mr. Wejr, do you think I am clever?” I smiled and stopped for a moment and said, “Tanya, the greatest thing about you is that because you do not speak often, when you do speak up, people listen. They know that what you have to say must be important and that what you say is, in fact, clever”. She responded with a quiet appreciative grin with a glimmer in her eye and continued on helping me stack chairs. Although there were many proud and emotional moments in which parents, staff, and students held back their tears, the moments with Andrew and Tanya completely summed it up for me. Had we carried on with the traditional awards ceremony, Andrew would have sat up there and watched as a few of his classmates received awards. He would probably not even have cracked a smile. This year, Andrew grinned from ear to ear and even leaned back and laughed as the cameras of his family took photos to help cherish the moment of recognition. The conversation I had with Tanya would have never taken place and I would not have shared a memorable moment with a ‘quiet,clever’ student. There has been an overwhelming response to the previous post on the decision to change the ceremony (once Alfie Kohn tweeted it, people from around the world stopped by to read it). There is obviously a huge interest out there around this topic. So my question is: why are we still having huge ceremonies that award a select few and fail to recognize so many strengths, talents, and interest of our students? 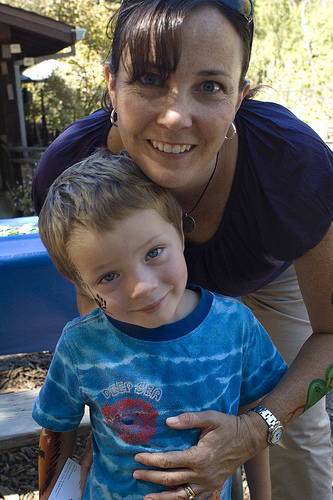 Parents of students at our school, I would love for you to leave your feedback about the 2010 Kent Year-End Ceremony. To read my Farewell Speech to the Grade 6’s, please click here. I look forward to witnessing the growth of this event and Kent School in the coming years. This is the time of the year that most schools are meeting and arguing over who is the top student in a variety of categories; high schools have selected their valedictorian (mostly based on who has the highest grades) and majority of schools are gearing up for their annual awards ceremony. Yesterday, at our staff meeting, a decision was made that will change the way we end the year at Kent. If you are a person who believes school is all about grades and awards, I am afraid that you will not like the decision made by our school yesterday; if you are a person who loves the idea of the “proud parent of an honour roll student” bumper sticker, you may be frustrated by our school. June 1, 2010 marked the end of a tradition at our school – a tradition that awarded top students not for their efforts and learning but for their grades and achievements. 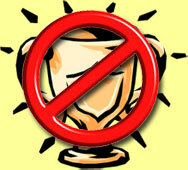 The staff at Kent School decided to abolish the “awards” part of the year end ceremony. Academic award winners? No more. Athletic award winners? Nope. Honour roll ? Nuh uh. Part of our school goal is “for each student in our school to recognize and develop his/her unique talents and interests…”. The key words in this are “each student”. We do not want to just recognize those that excel in specific areas, we want to recognize EACH student for the areas in which he/she excels. As a school, we need to move away from the traditional educational hierarchy that says those students who excel in language arts and maths are more important than those who excel in fine arts. We need to move away from recognizing only those students who have figured out the “game of school” and know how to “do” school well. What motivates students? Grades (and honour rolls) or learning? There are many students that are unfortunately only motivated by grades. This is not their fault, it is what has been taught to them. The comments such as “if you want an A, you must do this…” or “if you do this, you will lose marks” have taught students that grades and achievement is more of a priority than learning. Grades are extrinsic motivators while learning results in more intrinsic motivation. So, do we want students to motivated by grades or learning? Learning! When I ask our grade 4 students what the honour roll is, they have not a clue, nor do they care. Yet, in the past we have awarded certain students for getting good grades by giving them a certificate and telling them that they made this esteemed club called the honour roll. By doing this, what are we teaching kids? Are we not teaching them that it is not so much the process of learning that is important but it is the resulting grades and report card marks? Carol Dweck, in her book Mindset, talks about the difference between praising students for their effort and ability. If we praise students for “being smart” or “being athletic”, research says that we create students who are afraid to take risks and usually shy away from challenges. What kind of students do we want – those that rise to the challenge and take risks or those that believe that what they can or cannot do is ‘fixed’ and based on how ‘smart’ they are. “…researchers have found that children who are frequently rewarded — or, in another study, children who receive positive reinforcement for caring, sharing, and helping — are less likely than other children to keep doing those things. So what will our year-end ceremony look like? Each grade 6 student will be honoured and recognized for their strengths, talents, and/or interests. There will be no honour roll, no academic winners (and losers), no athletic award winners (and losers) and no recognition that one student’s talents are better than another. The focus will be on EACH student and not just CERTAIN students. In schools we always need to question and reflect on why we do things. Why do we present awards to certain students? What does this do to help learning in schools? Why do we state that proficiency in math is more important than excelling in theatre? How do we motivate our kids? When our answers to these questions do not place student learning at the forefront, we need to change the way we do things. At Kent School, we have by no means solved all that is concerning with education, but we have made a step forward. Thank you to Roxanne Watson (my previous principal & one of my mentors) for helping to fuel the passion in this area and starting the conversation with our staff.